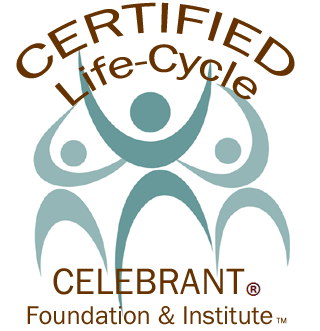 I am a Certified Life Cycle Celebrant, earning my diploma through the Celebrant Foundation & Institute, and an Ordained Inter-Spirtual Minister. I honor all ceremonial traditions: non-denominational, spiritual, religious, interfaith and civil. Ceremonies may be my most recent pursuit, but in some ways I feel like I have been training myself, honing my skills and gifts for this for years! I’ve been a small business owner since I was 24, and learned early on the need to be organized, professional, genuine and straightforward in my communications with others. I taught jewelry classes and workshops for 2 decades. And for the past 16 years, I’ve directed a yoga studio, teaching weekly classes and leading retreats and workshops. Celebrant work feels simply like an extension of the same passion that I have always expressed for love and for life! One must learn to lead well, have good people skills, a great sense of humor and a healthy sense of purpose to do both of these endeavors! To make notable jewelry, I had to learn to hone my creativity and my ability to think out of the box and hold a true appreciation for beauty and hard work. As a workshop leader in both jewelry and yoga, I needed to be able to listen well and speak well in front of a large group. And most importantly, these experiences cultivated an ability to be a strong force of positive energy, while having a calming, comfortable presence. My playful side is strong and so is my reflective side. I think it is that balance that makes me a good celebrant. All milestones in life can be enhanced with ceremony and ritual. I have been well trained so that each ceremony is uniquely personal, and a collaboration of your wishes and my guidance. I promise you a celebrant with a love for her job, a set of professional skills that underpin her work, and a commitment to excellence.